Tis the season here in Tucson for events, pairings and coursed dinners! It seems that the local food community likes to wait a bit till the coast is clear of tourists, students and snowbirds to showcase their talents and tastes, under the cover of summer, before the hilt of common cuisine bombast takes heed. 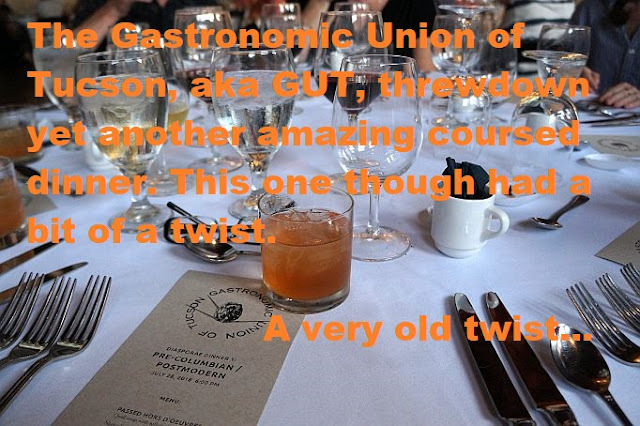 The Gastronomic Union of Tucson, aka GUT, as I have written about a few times before, is at the center of this attention and to start off the season of seasonings they went all out with a challenging menu for not just patrons but for them as well. This year the GUT collective stepped it up, way up, as far as preparing a coursed dinner is, and was, concerned. 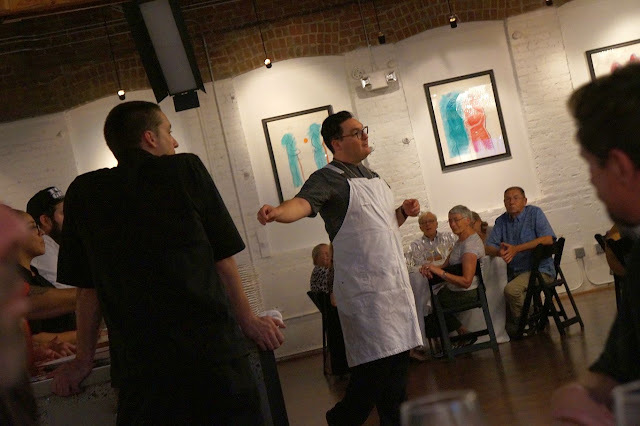 Their take, which they featured on a balmy Sunday evening at the Carriage House, was food inspired by ingredients native to southern Arizona, and regional desert climates, before the "Columbus" era of European influence came into be and became quite the norm for native peoples. This means cooking with no butter, no flour, no sugar, no cow meat and no animal fats. Quite the audacious contest wouldn't you say? I do say! 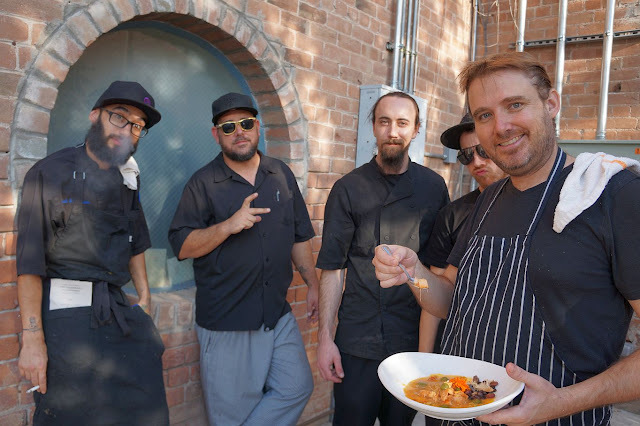 So the chefs had to develop dishes that incorporated proteins and plants that were, and still are, indigenous to Tucson and beyond. Thing is, they still wanted to show off so they included the term "postmodern" in with their pre-Colombian moniker. Of course they did. 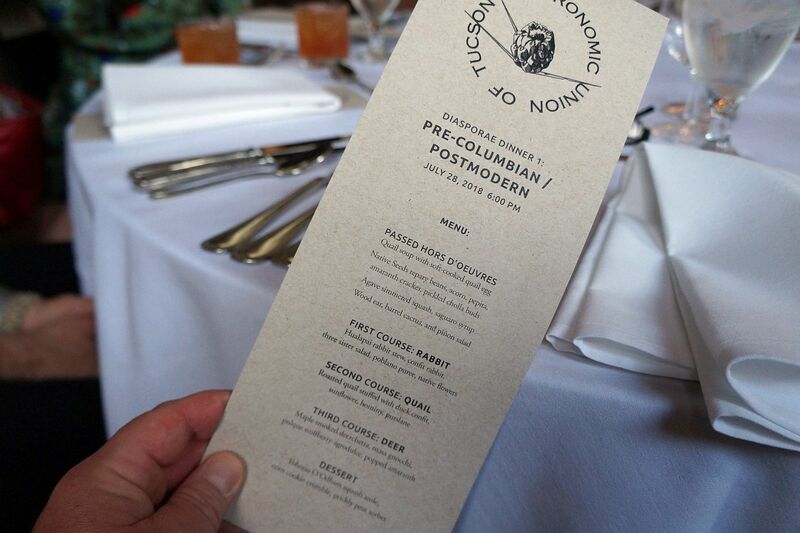 You think these chefs want to deliver a boring plate of just some elk meat, potatoes and like bits of cactus? Yeah. No. This is how they do. It was a great turn out for the event; was really nice to see all seats accounted for with curious and eager palates. 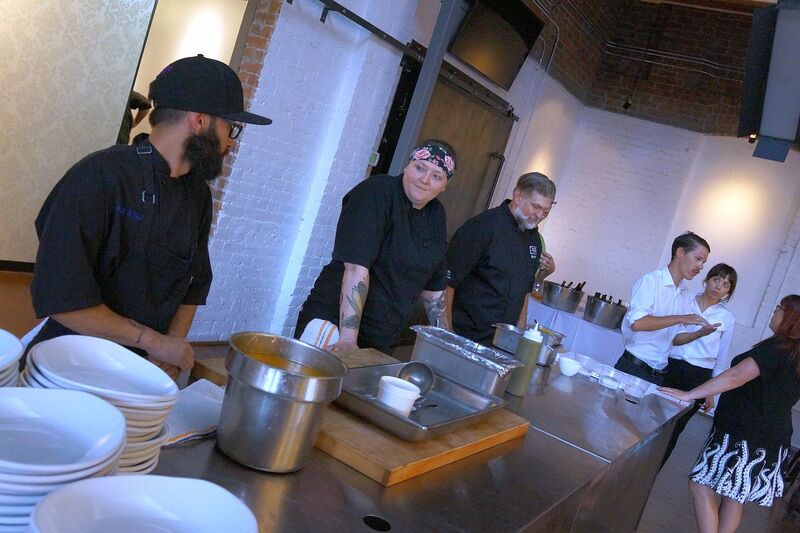 With a brief introduction by Carriage House executive chef Devon Sanner, who was cold rocking a twisty waxed 'stache that night, the shared appetizers made their way around to each table. The quail soup with a quail egg was a good starter; brothy and lightly firm in flavor. The only problem was is that my shooter did not have an egg in it. Oh well. The tepary beans, pepita, acorn and amaranth cracker with pickled cholla buds was fun, but as my table neighbor noted, the cracker tasted a bit like a granola bar. It was still really tasty. 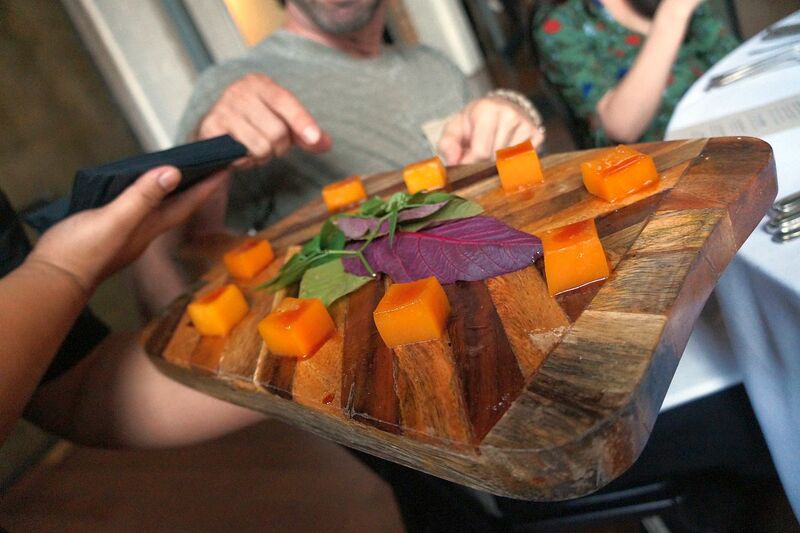 The standout was the agave simmered squash in saguaro syrup. 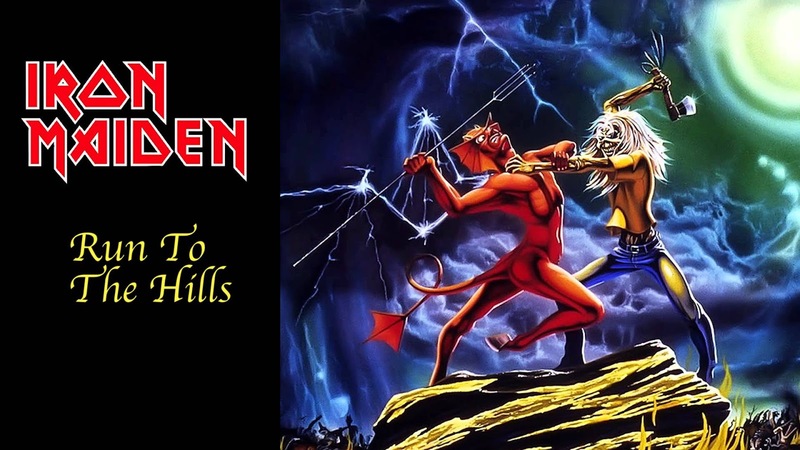 Oh man, this was awesome. To me the texture and flavor took on an almost sweet potato sense, and that, dear reader, is an alright thing. I kind of forgot what the cocktail was that they served but it was pretty good. Real earthy and a bit syrupy. The servers began to come around and pour wine meaning that the first course was on its way. First up was a Hualapai rabbit stew. The Hualapai is a tribe from northwest Arizona and the name breaks down to 'People of the Tall Pines'. 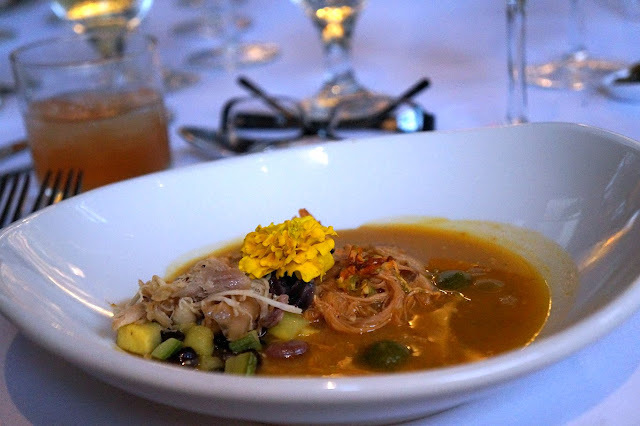 The stew consisted of a confit of rabbit, a "three sister salad", a collection of squashes, corn and beans, a poblano puree then finished with a tart edible local flower. Myself and table neighbor to my right literally licked the bowl clean. Every component was well considered and executed even more precisely. Very, very impressive. We were off to a very good start. Next up was a bit of a madman. 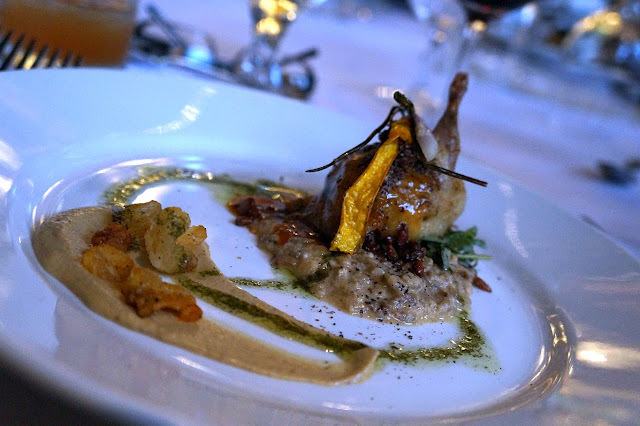 This was a roasted quail that was stuffed with a duck confit, paired with sunflower oil, a hominy puree and purslane, which is a edible succulent, pesto. The quail was intense, both in flavor and blandishment. I could have eaten like a dozen of these things. The flavors all made sense, if not intrigued a bit. Not too sure what those 'corn nuts' were, sort of like hominy, but perched with the puree and the telluric grits, this should be given a place in a permanent menu somewhere. Again, the plate was spotless when the server removed it from my spot. Wow. GUT has really moved forward with their cuisine. Made me almost not want the dinner to end. Thing is that European influence didn't take full effect until almost the 18th century and a lot of people don't know that tomatoes, wild rice, pumpkins and even cranberries were available to native people for centuries. So this dinner got down to its core. You can tell there was a lot of research and thought going into each dish. And all I can say about that is...thanks GUT! 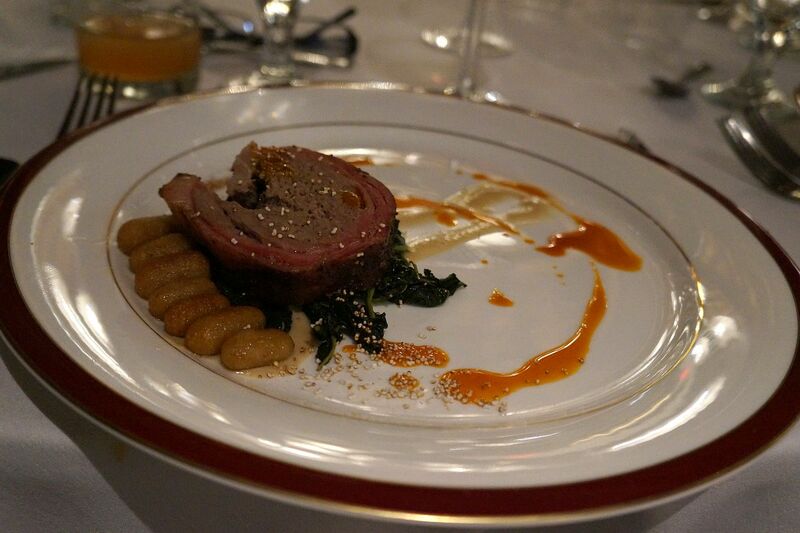 For the third and final course there was a bit of an Italian take on indigenous game meat. They created what they dubbed "Deerchetta", a porchetta made from, that's right...deer. Included was masa gnocchi, popped amaranth and a pulque (an alcoholic drink made from fermenting sap) wolfberry (aka goji) agrodolche (an Italian sweet and sour sauce). Although massively delicious, it was really rich with a grainy hue. It took a few bites to get my palate aquainted with what was going on. By the time I was finished, my mouth was asking "Yo, is there any more?" This was an excellent way to end a very adventurous, and essentially historical, coursed dinner. And this is why Tucson is the first US city of noted gastronomy. Because we straight killing it! 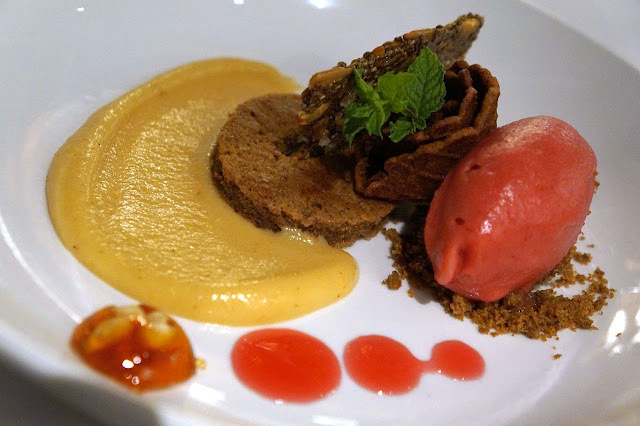 To finish everything off (remember, they cant use sugar or flour) was a dessert featuring a really refreshing prickly pear sorbet (very clever! 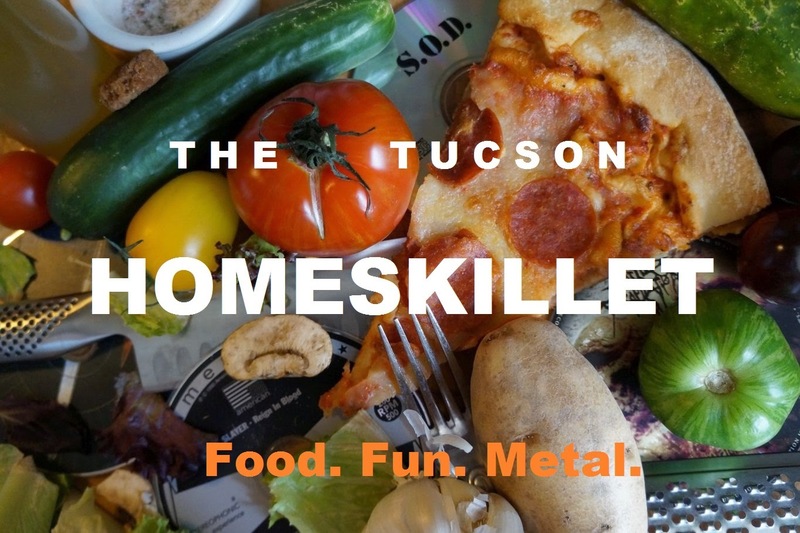 ), corn cookie crumble and a Tohono O'Odham squash atole (basically a corn and masa based beverage). There were also these hard candy dollops that were fun if not a bit tough to bite down on. But, whatever. With each element fixed into my spoon, it was as if the ghosts of the past wafted through with an appreciative grin, joyful to be mixed with 21st century techniques and vision. This dinner is only the beginning for 2018 and a grand step up from last years events. Not that I am saying last years dinners were crap...opposite!...but the confidence and measure of all the chefs has definitely grown. Its exciting to watch and best of all it is exciting to eat. 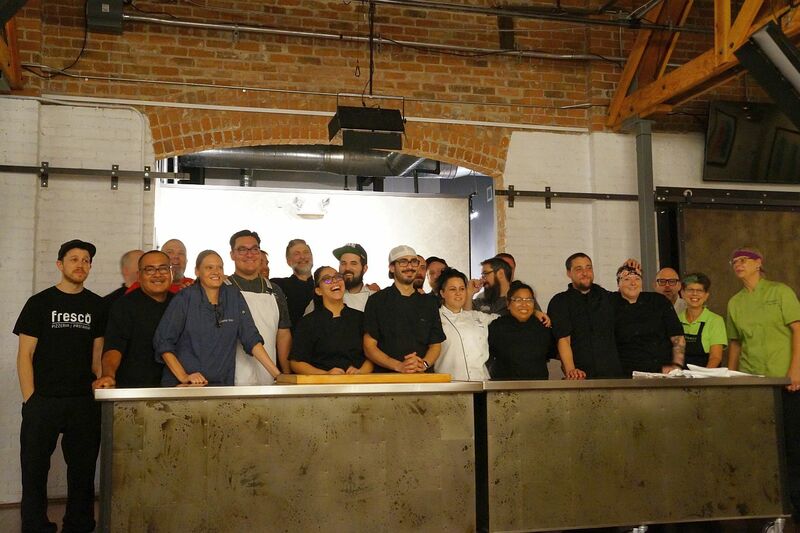 So thank you chefs and all involved with this season's first GUT dinner. If the ones to follow are any indication or reflection of this one, then Tucson is on its way to global celebrity and recognition. Until then, it is nice to have the town to ourselves, in a sense, so happenings such as this can be savored by us locals (yeah I know I wasn't born here but I've been here for over 12 years so...back off man) before the inevitable food flood comes barreling down. But that wont happen for a while I think. And hope.